and I'm here to read the funnies to you happy boys and honeys." Based on what is published in the weekly paper, The Comic Weekly Man entertains us with a dramatized reading of the Sunday comics, complete with sound effects and music. Young and old alike would follow along with the print copy in hand. 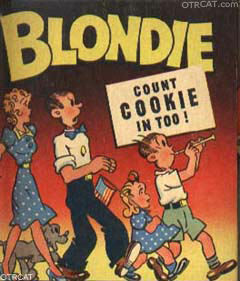 The Comic Weekly Man's readings include such great comic strips as Flash Gordon, Blondie, Beetle Bailey, Roy Rogers, Hi and Lois, Scamp and the Paint, and Little Iodine, among others. Be the first to comment on "Comic Weekly Man"